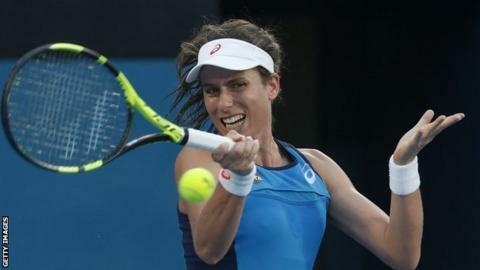 British number one Johanna Konta won the Sydney International on Friday with an impressive 6-4 6-2 victory over Agnieszka Radwanska in Australia. World number 10 Konta broke her Polish opponent in the third game and hit 18 winners to five in the first set. The 25-year-old dominated world number three Radwanska with some stunning returns and powerful hitting, and she convincingly won the second set. Konta finished the match off with an ace to claim her second WTA tour title. And Britain could yet boast both the women's and men's champions in Sydney, with Dan Evans defeating Andrey Kuznetsov to reach his first ATP Tour final, while Jamie Murray is in the doubles final. Konta, playing in the city of her birth, did not drop a set all week as she marched through a high-class field. "I was born here, so this is a very special moment for me," Konta said. "I'm really happy." "I'm really pleased with the amount of matches I've been able to play. I take it as a nice reward for all the hard work." The Briton's display will also give her confidence going into the year's first Grand Slam when she starts her Australian Open challenge against Kirsten Flipkens next week. She reached the semi-finals at Melbourne Park in 2016, losing to eventual winner Angelique Kerber. Konta had been beaten in both her previous matches against Radwanska, including the China Open final, and lost the first six points of the match. But, from 0-30 down on her own serve in the second game, Konta quickly turned the match around and took her third break point in the third game of match to seize the initiative. Her highlights in the first set included a second serve ace and some heavy hitting before a service game to love to wrap it up. Konta twice broke Radwanska at the start of the second set to go 4-0 up and she finished off proceedings with her seventh ace to secure victory in one hour and 21 minutes. "I can't remember playing someone like this on that level, that consistent for the whole match," Radwanska said. "I couldn't really say that I did something wrong. She was just playing amazing tennis and was aggressive from the first shot." This was a breathtaking performance by Konta - she was very aggressive from the baseline and served superbly. The 25-year-old has given plenty of notice of her talent over the past 18 months, but this was a display which marked her out as a potential winner of the Australian Open - although her draw is very tough and she has played nine matches on two continents in the first two weeks of the season. Konta will equal her career high ranking of ninth on Monday and no player has accumulated more ranking points than she has so far this year.